We have helped many of our clients build their online stores on all the major ecommerce platforms, including Shopify and Magento. 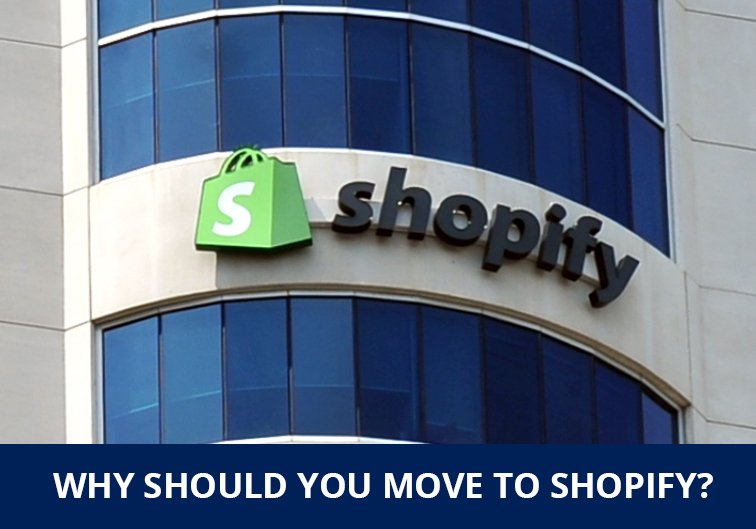 We have analysed the pros and cons of Shopify and here are 7 reasons to move to Shopify. Easy to setup and manage: Managing an online store can be daunting for a merchant who is only exposed to a brick and mortar setup. Users of Shopify claim that it needs less implementation time with its handy drag and drop functions and user-friendly tools. Unlike other platforms which demand high technical knowledge and effort even for grouping of items, the ‘Smart Collection’ feature of Shopify helps sort the products without any fuss. No additional manpower requirement: Shopify comes as a SaaS (Software as a Service) model and has its own unique benefits. Merchants will find it easier to set up their business and sell things online without burning a hole in their pockets. All the irksome affairs including hosting and deployment, programming, payment gateway, site maintenance, etc. will be taken care of Shopify team, with you being given the full control of your business. You are therefore relieved from the stress of hiring and maintaining a technical team and can reduce operational costs and tension. Smart plug-ins: What makes your e-com site different from that of your competitors? Obviously, its bells and whistles. Shopify hosts a collection of plugins that you can deploy without any technical assistance or coding knowledge. You will find nearly 1200 integrated apps including Facebook, Amazon, Mailchimp, Discount Code etc. stacked in its app store, which are designed to smarten up your site and ease your internal operations. Support at your beck and call: Another benefit you can avail of is Shopify’s 24/7 support team who respond to your questions even at odd hours. Contact them during the dead of the winter or during the wee hours of the day, you get your query answered then and there. Foolproof security: Security is a major aspect of any ecom site. It should guarantee the customers that their personal as well as financial details are secure. Shopify is foolproof and a PCI DSS Level 1 certificate holder. Needless to say, with Shopify you can assure the highest level of protection to your customers. Dynamic interface: How would you want your online storefront to look and feel? Cool and inviting? The principle of law of attracting customers is the same everywhere, be it a physical store or an ecom site. The thumb rule is that it should be spick and span, with the right orientation. Shopify is very popular for its vast choice of themes, all responsive. There is a least chance that you don’t find your kind of theme from the list. Choose the one that suit your business and “click” apply to redesign your store. What’s more, Shopify offers a mobile app as well so that you can run your business conveniently on your phone. Always prepared for traffic spikes: Traffic is good but you have to be prepared for it. Unexpected surge in traffic can render your site useless for customers. The moment your site is down, your competitor picks up your business. With Shopify, you are less likely to experience this. Shopify is more scalable than any any other ecom platform on the market, currently. This is largely due to the cloud hosting feature that allows the platform to adapt to the change in traffic. When a surge is recognized, the platform will immediately scale up to meet it thereby assuring an unflinching user experience. You now have a gut feeling that this is going to cost you big bucks. You are wrong, Shopify is very transparent in terms of its pricing. And you won’t find any hidden charges being attached to your bill. Trust us! What you can do on Shopify, can never be done on any other ecom platform, for sure. Talk to us and we will help you migrate your existing ecommerce business to Shopify or help you build a brand new online outlet.